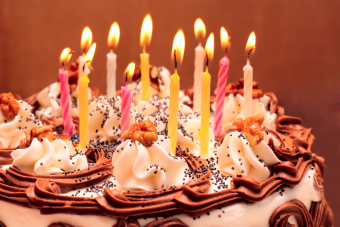 Heily O. asks: How did the tradition of having cakes with candles on them for birthdays start? For most of human history, ordinary people’s birthdays weren’t cause for much celebration. In fact, in the ancient world if you weren’t among the elite, odds are your birthday would have mostly just been noted for things like astrological purposes, rather than throwing parties in your honor annually. As for the Ancient Greeks themselves, while not connected to a birthday, we do know they served some form of cake with candles to honor Artemis, the goddess who, among other things, had dominion over the Moon. As such, people offered cakes that were not only shaped like said celestial object, but decorated with lit candles, presumably to make it glow. It has also been reported that the smoke of the candles perhaps was thought to help the goddess hear an individual’s prayers as it ascends to the heavens. Like the Persians, the Romans (circa 2nd century BCE – 5th century CE) are known to have celebrated the birthdays of at least some “commoners,” although it doesn’t appear that the custom was as ubiquitous as it is today. Rather, when a wealthy person reached a major milestone like 50, his family and friends might throw the individual in question a party and serve a special sweetened cake. Despite that the Romans had dipped candles made from tallow going all the way back to around the 5th century BCE, it does not appear that they put candles on the birthday cakes, however. The Chinese likewise have long had birthday celebrations, though eating cake on said day has only been an exceptionally recent phenomenon, adopted from the Western world. Instead, in China it is traditional to eat longevity noodles on one’s birthday. During the Middle Ages in the Western world, beyond record keeping not exactly being a priority of the time in this region, it appears birthdays and birthday cakes were not too prevalent, in no small part because of early Catholic dogma that considered birthday celebrations to be pagan heresy. Things began to change on this front beginning around the 12th century, when records of common births were again being meticulously noted. As babies were also honored with the name of a saint to protect them, people began celebrating their saint’s day (as opposed to their own birthday). As for re-introducing the birthday cake, this is seemingly thanks to German bakers starting around the 15th century. At this point, they began marketing single-layer cakes for birthdays, especially for one’s first birthday. By the end of the 18th century, besides the Western world again starting to somewhat commonly celebrate birthdays, the Germans had evolved their birthday cake a bit, including the very wealthy sometimes ordering elaborate, frosted birthday cakes not that different from what we have today. Pertinent to the topic at hand, the Germans were also now putting candles on the birthday cakes, as seen in their Kinderfeste (children’s festival) birthday parties. As to who came up with the idea of including these candles and why they put them there, this isn’t clear, though it is known that at this point they were adding candles numbering at least the years the child had been alive plus often more in the hope of a long life to come. Thus, it has been speculated that the impetus for the candles was to represent the “light of life.” Other speculative claims state more pagan-like origins, such as that the candles were there to protect the child from evil spirits and that the parties themselves were for grouping together in hopes of fending off evil spirits, with the anniversary of one’s birth supposedly making a person more vulnerable to said spirits. From here this practice of ornate, candled cakes for one’s birthday spread throughout Europe, presumably initially with the elite of the continent copying one another and it filtering down to those who could afford it from there. As for the United States, primarily for religious reasons, celebrating birthdays at all didn’t become widely popular until the early 19th century. Notably while Protestants were coming to embrace the idea of a birthday at this point, Catholics in the country still largely had religious issues with celebrating the anniversary of one’s birth. It should also be reiterated that at this stage having sweetened cake on one’s birthday, particularly multi-layered, frosted ones as we often see today, was still something of an expensive luxury only the affluent could afford. It wasn’t until the end of the 19th century that ordinary people had sufficient funds, and ingredients were cheap enough thanks to the industrial revolution, that the masses began incorporating enriched, frosted birthday cakes as part of a birthday celebration. When this happened, the idea of a candled cake and party on one’s birthday became nearly ubiquitous in the Western world, as it is today, save for some who still abstain from the practice for religious reasons. So in the end, while the tradition of putting candles on cake and serving it on one’s birthday may seem like a timeless practice, this is actually a relatively modern phenomenon in human history. The music to Happy Birthday to You was written down in 1893 by Patty and Mildred J. Hill. Originally with different lyrics and titled Good Morning to All, it was sung at the start of the school day. Despite that they likely copied the tune from somewhere else and in turn someone else came up with the modern lyrics a couple decades later, up until 2015 the song was copyrighted, earning a couple million dollars annually for Warner/Chappell Music who claimed they held the copyright. However, finally in 2015 a class action lawsuit against said company was settled for $14 million when Warner/Chappell could not show that they actually held the copyright for the song, despite that they’d been charging businesses to use the song to the tune of about $2 million per year, as mentioned. It appears from this that the song may now be in the public domain, though this isn’t quite clear yet, as it’s technically possible another company may come forward to claim copyright on it, though this is probably unlikely. Happy Birthday’s previous copyright status is why at certain restaurants they have their own unique version of the song they sing to customers on their birthdays. Of the 100 oldest verified people, the youngest was American Delma Kollar, who died on January 24, 2012 at the age of 114 years, 85 days. Interestingly, among those 100 people, only 6 were men. When Did People Start Celebrating Birthdays?